I have been going through the penguin edition of Strange Tales from a Chinese Studio by Pu Songling and making monsters, NPCs and scenarios. Today I am doing A Most Exemplary Monk (#22) and Magical Arts (#23). You can see my previous entry HERE. 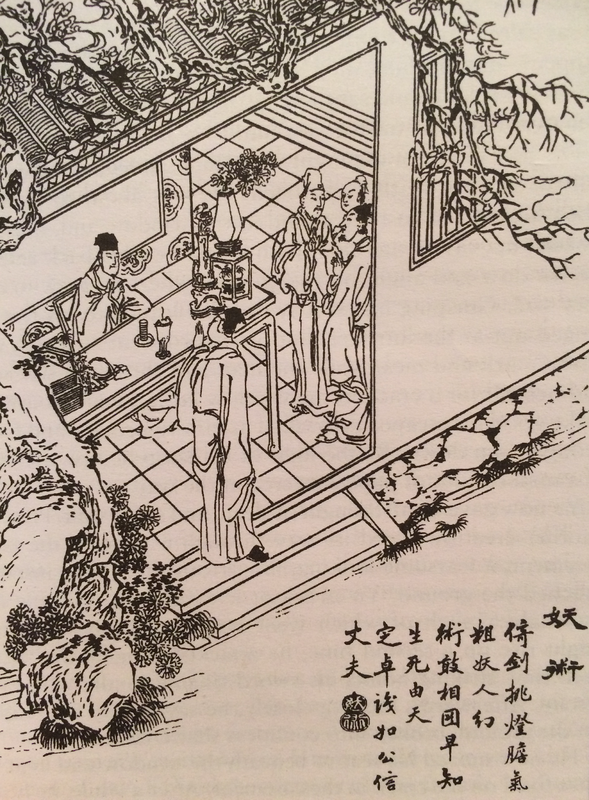 A Most Exemplary Monk is a story about a man named Zhang who dies early and appears before King Yan (Yama) in the underworld who realizes they've brought the wrong person before him. Before he is sent back Zhang sees strange places like the Mountain of Knives and Forest of Swords, but is eventually taken to a monk hung upside down by a rope tied through a hole in his leg. He recognizes the monk as his brother and learns he is there suffering punishment for a vile deed. His brother is still alive however and when he goes back he immediately seeks him out and tells him what he saw. There he finds his brother in a terrible state, laying upside-down with an abscess on his leg in the exact spot the rope bored a hole. His brother tells him this is the only position he finds comfortable due to the abscess. He decides to reform himself after hearing his brother's account and becomes a monk of excellent character. Magical Arts is about a man who goes to a diviner and is told that he is fated to die in 3 days. The diviner then offers to provide him with a way of averting this disaster if he pays 10 silver taels. He refuses and the diviner retaliates by sending monsters after him shaped from various figures. I think Magic Arts has solid potential for adventure material. It is an example of how a passing encounter with a fortune teller can result an interesting challenge for the party. I liked the monsters so much I decided to model them as purely as I can here. A Most Exemplary Monk got me thinking more about how to use death in the campaign and how that can be a springboard to adventure (this was something Bill Butler used to do all the time in our games). It also got me thinking about mapping out Emo Chung further. I do have several maps of the various realms in Wandering Heroes of Ogre Gate. I treat them a bit like regular places, just with more possibilities for creative options. A good movie to see for ideas is Heaven and Hell by Chang Cheh. Also Journey to the West, the classic novel, has great descriptions of hell. Because my time is limited today though, I decided to talk a bit about adventure ideas created by character death and appearing before the Eight Magistrates. In Wandering Heroes of Ogre Gate when characters die and appear before the Eight Magistrates, there is a chance their death was a result of a bookkeeping error (WHOG page 420). This can be determined by having the magistrates examine the book for errors, as well as making a special plea which is then treated as a raw percentage chance. 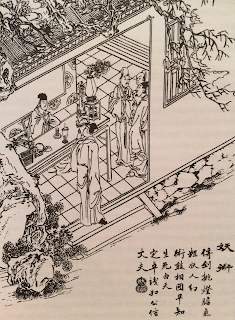 One possibility inspired loosely by A Most Exemplary Monk is allowing the player to offer to perform some service in the world or go on a quest, to regain life. At the very least, this could add +10% to the roll (I would probably add 25%). The magistrate could even propose it if there is a need for a special service. I think in order for the quest to have meaning it would need to be difficult, game-worthy and bring greater risk to the party (i.e. not only might the character being saved die, but the other characters would face possible death as well). The player could be sent back to help steer a misguided ruler back to the path of righteousness for example by taking him on a Journey to the West-style adventure to obtain some religious scripture or holy relic in a distant land. Not only would he have to convince the ruler to go with him, but he'd have to accompany him. The adventure could be more mundane or small scale as well, as long as it meets the three basic requirements. These ritual figures are inspired by Magical Arts. They can be created with the Vengeful Figurine Ritual. With this ritual you create a figurine that can animate and attack your foe for one hour. There are three types of figurines you can make: Paper Soldier, Clay Beast, and Demonic Archer. To make a figure you must create it with the raw components (paper, clay or a puppet) and add your blood (taking 1 wound in the process). Roll any relevant Trade Skill rolls to create the figurines. Then make a Ritual Roll TN 7. On a Success the figurine comes to life for an hour and seeks out your enemies. On a Total Success the figurine comes to life for three hours. When animated these figures look like a human soldier, either of normal size or diminutive (the size of a hand). They can change their size at will and attack ferociously. When killed they revert to their real form: that of a slip of paper cut and painted into the shape of a soldier. Shrink or Grow (Counter): As a Move action, a Paper Soldier can shrink or grow. Normally it just uses this to avoid attacks. When doing so, roll 2d10 against the Attack roll, on a success it changes size and avoids being hit as a result. Otherwise it just uses this to alter its size. Use the stats in parenthesis for when it is small. These terrible creatures are the size of a large dog with stone gray skin and enormous mouths filled with piercing teeth. Whenever they are struck they split, weakening them but increasing their numbers. They are made from clay and look like a shattered ceramic jar when destroyed. Pounce: When a Clay Beast gains surprise by stalking its prey it can pounce on them. This does one Extra Wound on its Damage roll. Bite: The bite of the Clay Beast does 4d10 damage on a normal attack roll. On a Total Success it does 4d10 plus 2 Extra wounds. Splinter: Clay Beasts split into equal parts for each wound they take. Their overall number of wounds decrease but their numbers grow anytime they take damage (with wounds being split equally among the parts). These look like large 1- foot tall humanoid creatures with green skin, wild black hair and black eyes. They usually have a bow and sword and resemble a Zun warrior in dress. When killed they revert to their true form: a human-sized puppet made of wood. Arrow Rebuttal (Counter): Demonic Archers counter attacks by quickly firing arrows at the attacker (stepping back if need be). Anytime someone makes a melee attack, roll Small Ranged against the Attack roll. On a Success, if you exceed the target's Evade, you hit them and disrupt their attack.